WASHINGTON – Supporters of a copper mine proposed for Oak Flat have been given until Friday to make the case that the area, deemed sacred by the San Carlos Apache, should not be designated a historic site. Reps. Paul Gosar, R-Prescott, and Ann Kirkpatrick, D-Flagstaff, asked the National Park Service to withdraw the Oak Flat application to the National Register of Historic Places, saying it was confusing and vaguely worded in an attempt to undermine the proposed Resolution Copper mine. “We are concerned that the use of the phrase ‘Chi’chil Bildagoteel Historic District’ and a lack of geographic information is an attempt by these opponents to limit transparency and public comments from constituents that disagree with this nomination, and an attempt to undermine our bipartisan bill that is estimated to create approximately 3,700 new jobs,” the lawmakers’ letter said. The park service said it did not have the authority to withdraw a nomination to the register, but it could grant an extension to the comment period – which it did, giving opponents of the listing until this Friday. But supporters of the historic designation said the park service should grant the application. 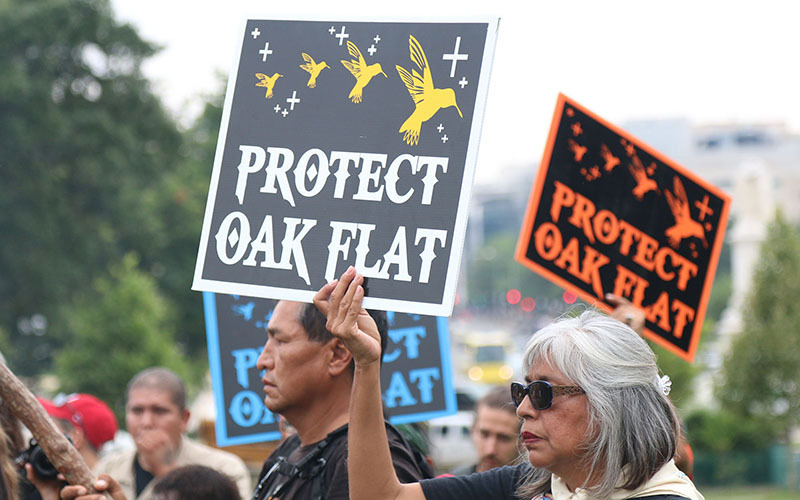 “Oak Flat is an important cultural and religious area that is vital to the traditions of our Native American brothers and sisters – it deserves our strongest protections,” said Rep. Raul Grijalva, D-Tucson, in a statement from his office Monday. “As someone who has fought to safeguard this treasure for years, I fully support designating the land as a historic property listed on the National Register of Historic Places and encourage the National Park Service to evaluate the proposal based on its merits,” his statement said. Gosar and Kirkpatrick were not available Monday to comment. They were among the lead sponsors of a bill, the Southeast Arizona Land Exchange and Conservation Act, that called for the federal government to swap 2,400 acres of copper-rich federally owned land for about 5,000 acres of land owned by Resolution Copper. The mining company has said that its project would provide thousands of jobs in southeast Arizona and would pump billions of dollars into the state’s economy over the expected 60-year life of the mine. But included in the land the mining company would receive is the Oak Flat campground, an area in Pinal County that the Apache say is spiritually significant. They have come to Washington to protest the mine, mounted a petition in opposition to it and protested at the site. Critics – including Gosar and Sen. John McCain, R-Arizona, who helped push the land swap deal through the Senate in late 2014 – have charged that there was never any spiritual significance to Oak Flat until the mine came along. Being listed on the historic register would highlight the property’s uniqueness and its value to the community, but it would not ultimately protect it from mining, a park service official wrote in response to Gosar and Kirkpatrick. “Neither a listing nor a Determination of Eligibility for listing requires or otherwise guarantees that a historic property cannot be modified or even destroyed,” said Stephanie Toothman, the National Register’s keeper, in the letter to the lawmakers. Bill Tanner, a spokesman for Resolution Copper, also said a historic designation would not necessarily prevent the company from mining the land – it would just become another consideration in the process of determining the project’s environmental impact. “We believe that the most appropriate way to ensure that this matter is fully evaluated is through a comprehensive NEPA (National Environmental Policy Act) process that involves all stakeholders,” Tanner said Monday.